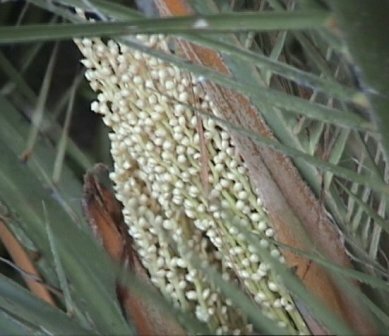 Dwarf date palm, as the name indicates, is a palm with very short stem. In India, it grows in outer Himalayan ranges from Uttarakhand to Khasi hills in East India. Its plants can also be seen growing in Bihar, Central India and parts of Andhra Pradesh. 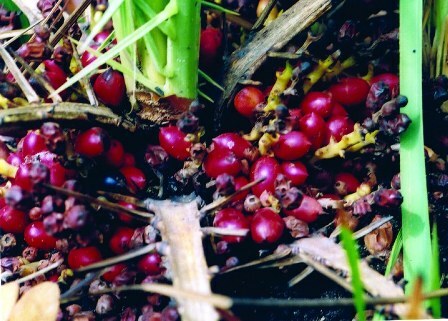 Besides India, this palm which bears sweet fruits, is also reported to grow in South East China, Nepal and Myanmar. 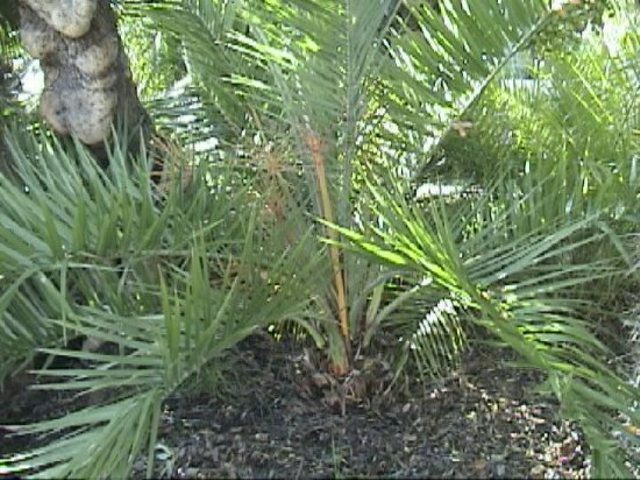 Acaulous palm; stem bulbous, to 10 cm high, densely covered with persistent leaf base stumps. Leaves 0.6 – 1.8 m long; leaf sheath reddish-brown, fibrous; rachis 0.3 – 1.5 m long x 1.5 – 2 cm in diam. at base; acanthophylls closely arranged in more than one plane, to 9 cm long; leaflets arranged in sub-opposite groups of 4s – 5s in more than one plane or orientation, about 16 – 24 on each side of rachis, linear, 8 – 36 x 0.5 – 1.4 cm, flaccid, with strong marginal nerves; lamina concolorous, pale green. Inflorescences held at ground level; staminate inflorescences not extending beyond prophyll; prophyll papery and splitting in many places, 13 x 2 cm; peduncle about 7 x 0.6 cm; rachillae arranged in one whorl, 10 – 15 in number, about 8 cm long; staminate flowers not seen; pistillate inflorescences not extending beyond prophyll; prophyll papery, about 25 x 4- 6 cm; peduncle about 9 – 12 x 1.4 cm, not extending on fruit maturity; rachillae arranged in one compact whorl, 15 – 20 in number, 4 – 14 cm, drying striate, with differential maturation of fruit along rachillae; pistillate flowers about 5 – 20 per rachilla, congested in arrangement, each subtended by a distinct rachilla swelling (bractiform notch), 3 – 10 mm long; calyx cupule 3 mm high; petals 5 – 6 x 4 mm. Fruit obovoid, 12 – 18 x 8 mm, ripening from green with scarlet apices to blue-black, with mesocarp scarcely fleshy and stigmatic remains prominently pointed (1 – 2 mm long). Seed elongate in shape, 10 x 5 mm, with rounded apices; embryo lateral opposite raphe; endosperm homogeneous. The fruits are edible. Though the most part of fruit is constituted by seed, but whatever pulp is there, it is very sweet. So the fruits are fondly eaten in large scale by tribal people in hilly districts of Indian states of Orissa and Bihar. The pith of the stem is also edible and eaten. It yields sago. The terminal leaf buds form a good vegetable. Even tender peduncles are also eaten. Dwarf date palm trees are slow growing plants. They seem to do better at places which get full sunlight and are not dry. This fruit is fairly cold hardy and can withstand temperature upto – 10 C.